These special encounters with strangers. A dialogue on a train, in a bar or in the streets. You share one rare moment of closeness with a stranger. Then you separate for good. Sometimes sad, sometimes relieved never to meet him again. But you'll never forget. An epiphany. When people die in a road accident sometimes their family or friends erect a small wooden cross along the road where it took place. As a memorial for the dead and a warning for other drivers. 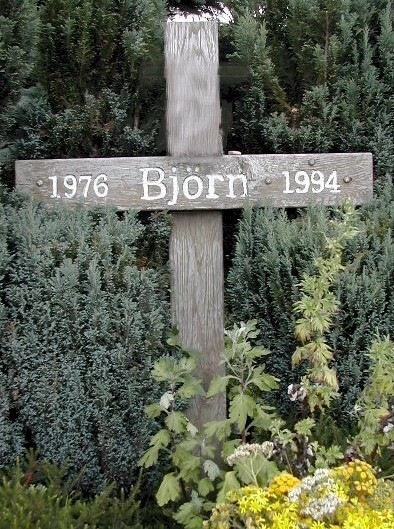 The crosses bear the name and the dates. Most of the bemoaned died young. Sometimes there are also flowers or candles round the cross. I take pictures of these crosses when I pass one. Media in vita in morte sumus. "The one that took pictures here last year, for a book." She paused, then, in a sharp voice "Why do you take a picture of this cross?" Me, with growing impatience "Why do you want to know?" "Because this is my son's cross." It struck me a blow. I fell silent, ashamed of my aloofness. She said, half to herself: "He was killed by a car. The driver became aware of him when it was too late, it was dark, he cycled along this road ... I stay here every summer, just across the place where he died. Maybe that's weird, but I feel near to him by doing this ... I hoped you were this photographer. She promised me to inform me when the book is published, so I can buy it. But she never called me. I searched for the book but I never found it, no bookseller could help me." "I'll help you to find this woman and her book." "Really?" - full of suspicion. After some investigation I found out that the book was never published, it was an abandoned plan. I informed her via the e-mail she had given me, but never received an answer. To stay near the place where one's most beloved was killed. A spell for both of them, mother and son. Das ist das Geheimnis der Anastasis: Wir SELBST sind es, IN denen die Dinge ewig leben. Nur das, was wir IN uns haben absterben, vergehen lassen, ist wirklich tot. I already wanted to comment on this yesterday, but strangely, it only seemed to work when logged in to LiveJournal (which I am not). This story was very touching. I had some of those unforgettable encounters myself. They can move lives. And now, I am waiting for the next encounters. For some reason, I am sure that you have spellbinding stories to tell, my dear.